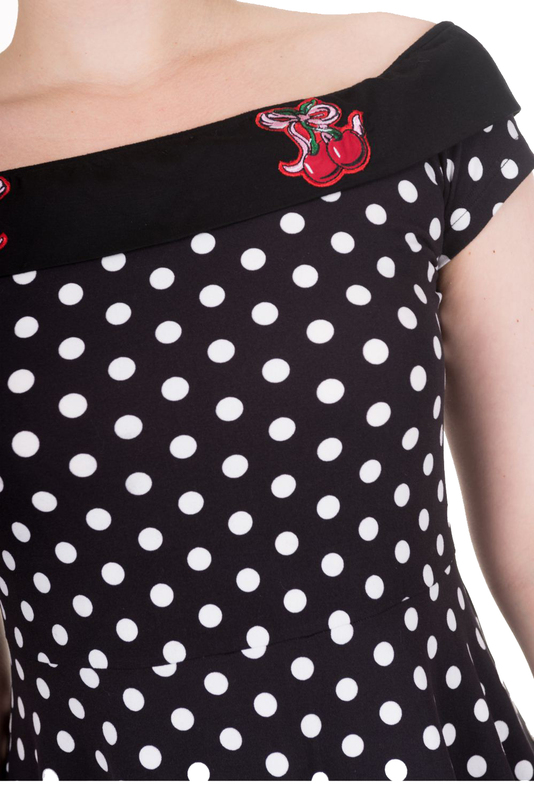 We present the Banned Reverly Polka Dot Mini Dress in UK Sizes 8-16. The style of this dress transforms this sensational 1950s style number to a cheeky cherry style which will get you noticed at your upcoming event! The neckline boasts the 1950s era with a brigitte bardot slashed neckline, together with a fruit motifs located at the shoulders providing a retro look. You'll look as sweet as a cherry in this number as it exhibits a delightful embroidered red cherry motif to the neckline, teamed with a punchy polka dot print. The stretchy material provides comfort and support for a perfect figure flattering cut fit whilst the skater skirt falls above the knee to a mini length style. It's simply a fuss free slip on dress, and the Banned Reverly Polka Dot Mini Dress offers a figure flattering cut! The fabulous cut and striking cherry motif, makes this dress an absolute pleasure to wear and it's a perfect party piece with a vintage 1950s twist. Dresses such as the Banned Reverly Polka Dot Mini Dress captivate any vintage night and it's certain to steal the limelight at your upcoming do!